Snack is a type of food that a lot of us are worried about when they decide to go Paleo or following any other healthy diet. Even though the Paleo diet contains a lot of fiber-rich foods that will keep you full for longer, it is still nice to have some sort of snack options whenever you have a ‘sweet tooth’ craving. legumes (some snacks contain soy that is a type of legumes and is not allowed on the Paleo diet). So as you can see the snack options left would be fruits, vegetables, nuts, and seeds. But is it the only option? Indeed, the Paleo diet recipes evolved from what our ancestors used to eat millions of years ago. So we still will be able to enjoy some snacks if we have a craving for them. Paleo Granola Crackers is a great snack that will satisfy your ‘sweet tooth’ or ‘chewing’ craving. It is also packed with seeds that will also add a lot of healthy value to your diet. Granola is a traditional breakfast meal that usually consists of rolled oats, sugar or honey, dried fruits and nuts or seeds in its healthy variation. So as you can see from these ingredients couple of them will be non-compliant for the Paleo diet principles. However, you still would be able to enjoy granola breakfast or snacks by eliminating ingredients like rolled oats and sugar. The Paleo granola ingredients would typically consist of a variety of nuts and seeds and mostly fresh fruits. 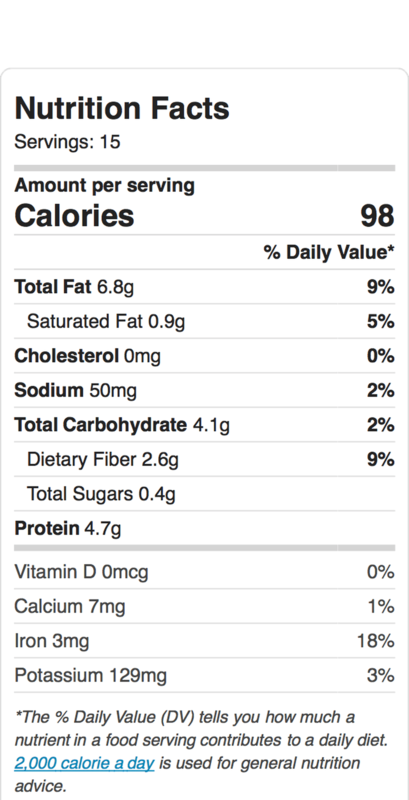 Dried fruits could be added, however, the close attention should be taken to the ingredient list of dried foods as most of them would contain added sugar. When it comes to the snack option a lot of us (especially the ones who just decided to start a healthy diet) think that fruits and vegetables are the only available options. And sometimes these limited options scare or demotivate some of us from moving forward with the healthy diet. For some people, however, healthy food is not a choice but a necessity dictated by their health. Nevertheless, you will be surprised to know that a healthy diet, including the Paleo diet, may offer plenty of other than fruits and vegetable snack options. 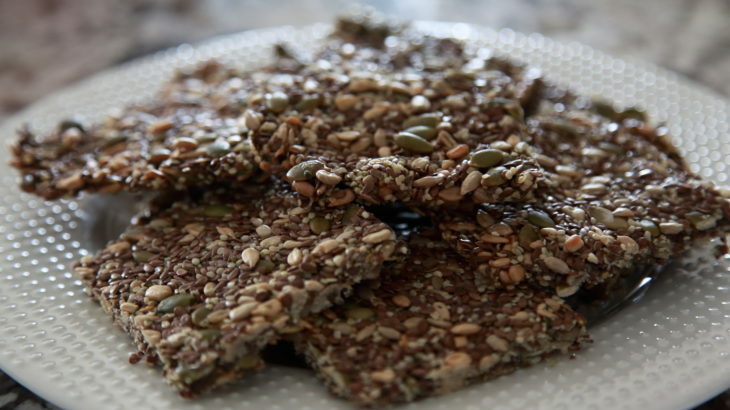 The Paleo Granola Crackers will be one of them (also check my Paleo Granola Cookies recipe). Flax seeds, pumpkin seeds, sunflower seeds and hemp seeds contain Alpha-linolenic acid (ALA), also called Omega-3 that promotes anti-inflammatory benefits. The typical American diet consists of mostly Omega-6 fatty acids that actually increase inflammation in our bodies. And inflammation itself is not a bad thing. It allows our bodies to heal and fight diseases whenever required. It becomes a problem whenever your body is in a constant ‘fight’ mode. Your body basically spends all its energy on supporting this inflammation mode that also causes certain diseases like asthma, osteoporosis, rheumatoid arthritis, osteoarthritis, and migraines etc. The recommended balance of Omega-6 and Omega-3 would be respectively 2:1 or 4:1 to support your body functions and decrease overall inflammation level. Adding cold fish, certain nuts and seeds like flax seeds, pumpkin seeds, sunflower seeds and hemp seeds will add a required balance of Omega-6 and Omega-3 to your diet. We all heard the saying that our health is in our guts. And it true simply because all our food, for the most part, is being processed and depleted in our intestines. Keeping our gut healthy will promote overall health in our bodies. Our guts need fiber to help to form and to move the masses. Seeds have plenty of fiber that will help you with constipation and promote overall health in your gut. And like with any other fiber the basic recommendation is to make sure to drink enough water. Fiber component that nuts and seeds contain will also help you to stabilize your blood sugar level. Fiber slows down the absorption of sugar that in it turn controls the insulin level production by our pancreas. The Omega-3 component in flax, pumpkin, sunflower and hemp seeds also play a significant role in stabilizing the blood sugar level. Nuts and seeds are great for weight loss. Nuts and seeds are rich in fiber that slows down the absorption of sugar in our blood and makes us feel full for longer. The trick is to make sure to drink plenty of water when consuming fiber rich foods. Water tends to increase the fiber in volume that in its turn makes us feel full for longer and promotes weight loss by reducing the overall food consumption. As I have mentioned earlier seeds like flax, pumpkin, sunflower and hemp contain Omega-3, i.e. anti-inflammatory fatty acid that helps to decrease overall inflammation in our body. And if your body spends less energy on trying to ‘treat’ itself, it leaves more energy for you to utilize. Flax, pumpkin, sunflower, and hemp seeds are also rich in fiber that in its turn slows down the sugar absorption and constantly fuel our body with energy. This recipe is great as it could be adjusted based on your needs and taste preferences. 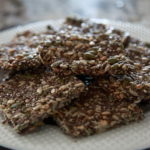 The simple version of this recipe is a plain Paleo Granola Crackers recipe without adding any natural sweeteners like pure maple syrup. It is a great snack option for times when you need to quickly fuel your body or would like to satisfy your chewing craving. The seeds component could be changed and adjusted based on your preferences. One of the options is to substitute hemp seeds for sesame seeds. This snack could be a nice sweet treat if you add a natural sweetener to it. In both variations make sure to drink plenty of water. Paleo Granola Crackers will be a great snack that will not only satisfy your cravings but will also add some health benefits. Use a wet spatula to avoid the mixture sticking to the spatula while spreading into the baking sheet. Use whole raw seeds, preferably organic. 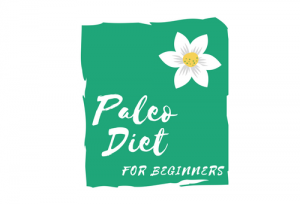 Paleo Diet Dessert, The Paleo Diet Recipes granola crackers, healthy snacks, paleo granola crackers, paleo snacks. permalink. I’m on a diet right now. Lost 9 kg, still 15 to go. I’m really calm this period, not very much to do, so it’s not very hard, but still. Sometimes, I find that I lack energy. Probably due to not good enough eating habits! You have already had a great success with your weight loss journey! 9 kgs is a great result. I know that it might still look like a long way to reach your weight goal target, but you can definitely do that! Treat any changes as something that will stay with you even after you reach the final destination. That way it will be easier to adjust to the changes and make it your permanent lifestyle change. A lot of my friends have been going on this Paleo kick so I had to check this out for myself. This is great info here, these look like they taste great and the instructions on how to bake them seem easy enough. I have to try this recipe out and see what my friends have been ranting about this whole time. Thank you for the info! Absolutely, give this recipe a try and see how you like it. It is definitely not a regular looking treat but it is definitely extremely nutritious and beneficial for our health.